Records tumbled in the sunshine at St Peter’s as the new All Golds side ran in 18 tries and added 14 goals to hit a round century of points against Swindon St George’s second string. The score was the highest for the All Golds since they merged with the Gloucestershire Warriors though injuries and the sending off of loose forward Matt Young meant that Swindon could only field 11 fit men for the final half hour. That said, the visitors applied plenty of pressure to the All Golds line thanks to a favourable penalty count but with two extra men and their superior speed, the home side were always able to snuff out any danger. Three All Golds collected hat-tricks as Luke Stephens marked his first appearance of the season with three scores either side of half time and Aedan Coleman also crossed three times. Scrum half Callum Merrett added a dozen goals to his second hat-trick in three games for a personal haul of 36 points. Coming into the game, both sides had a 100% record from their two games played so far, with the All Golds top of Pool C on points difference owing to their big win over the Forest Bulldogs in their last game. The scoring started in the second minute as Ash Lewis sold a simple dummy and coasted through the gap that appeared to score. Swindon looked capable in possession but sooner or later an error would occur and the All Golds had the strike power to punish these to the full. After seven minutes, a penalty earned the visitors a repeat set but the ball went to ground, Aedan Coleman swooped and raced to the posts. The visitors didn’t see the ball again for a full 15 minutes as the All Golds ran riot and crossed for five more tries. By the time Swindon got their hands on the ball again, they were 40-0 down and out of the contest. Aseri Lewesaru went in from Josh Llewelyn’s offload before Stephens’ scoot and pass to Jack Uren resulted in another four-pointer. Coleman beat three men down the touchline to score his second try on the All Golds’ next possession and then, from a tap penalty, Merrett dummied through for the simplest of scores. The scrum half’s sleight of hand then resulted in another easy try and the All Golds were 40 points to the good with barely a quarter of the game gone. Finally, with ball in hand, Swindon got to their kick with their next possession before the All Golds extended their lead, Connor Jones bumping off defenders to crash over. With half an hour gone, Merrett scored straight from a well-worked scrum move to send the score past the half century and then, just before the break, Joe Uren’s offload sent Stephens scampering to the line from halfway. Stephens then crossed twice in the opening three minutes of the second period before play began to get scrappy. By this time, Swindon were playing with 12 men having lost players through injury and, immediately after Coleman fielded James Slatter’s short kick through, beat two men and raced away to the sticks, they lost Matt Young to a red card for a punch after an altercation in the tackle. Dean Cooper extended the lead with a close range try by the posts but it was the visitors who had the better of the last quarter. However, playing against 11 men, the All Golds were always able to find the extra man in defence and when they had the ball, there was space to score from all sorts of distances and angles. Jack Uren scored his second of the day breaking through the middle, before Tom Gaffney raced away for another breakaway try. Swindon pressed unsuccessfully on the All Golds line until Brandon Lamb snatched an intercept and converted the try himself. The All Golds’ final try came courtesy of Merrett who picked off another Slatter kick raced to the try line before handing the ball to Kieran Webb for the touchdown. 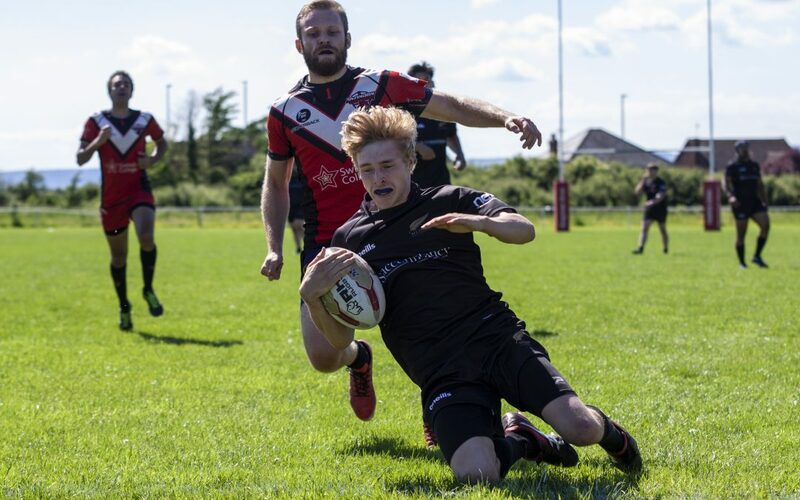 Merrett brought up the century with the conversion and kept the All Golds’ winning run going but it will be tested more strongly next week when Cheltenham Phoenix visit St Peter’s for an eagerly anticipated derby. ALL GOLDS: Josh Llewelyn; Tom Gaffney, Aedan Coleman, Brandon Lamb, Michael Holden; Jack Uren, Callum Merrett; Mitchell Dent, Luke Stephens, Aseri Lewasaru; Ash Lewis (Capt), Ryan Tanner; Dean Cooper; INTERCHANGE: Josh Foster, Joe Uren, Hector Silva, Connor Jones, Rhys James, Kieran Webb, Alasdair Anderson. SWINDON: Ryan Minns; Dan Bown, Nathin Smith, Ryan Lanlear, Ben Pemberton; Iestyn Lee Harry, James Slatter (Capt); Ben Brinkworth, Nick Blair, Rory O’Brien; Steve Oxley, Sam Goulding; Matt Young; INTERCHANGE: Joel Kenan, Mark White, Brad Weston, James Hackett, Dave Swinburne.